SuperSimple Video Converter is a free video file converter that also allows to extract audio from videos. 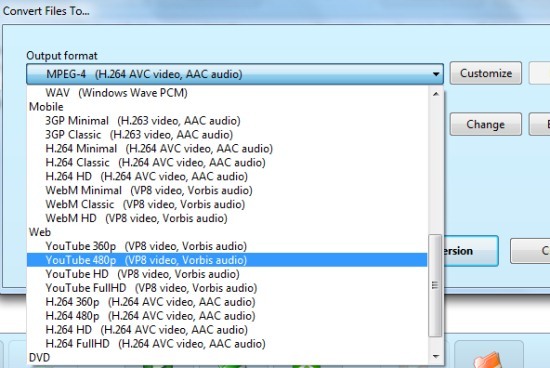 Its unique feature is that you can adjust encoding speed (slow, normal, fast, and maximum speed) which is not possible with most of the other video converters. However, selecting maximum speed will decrease videos quality, but it is quite useful in cases where quality can be compromised a bit. This video file converter is able to batch convert audio and video files. Another benefit of using this software is that you can get output media files for DVD, YouTube, and mobile devices compatible format. It’s a handy video file converter and is only 7.55 mb in size. Screenshot above shows interface of SuperSimple Video Converter and output format window to select output format. To convert multiple media files, use Open button available on its main interface. It supports all of the common formats as input, like mkv, vob, flv, mp3, mp4, ogg, avi, ac3, 3gp, and more. Here, drag n drop support is not available to quickly add media files which will disappoint you. After adding multiple files, you can hit the Convert button and a new window will open up. Using this window, you can select output format according to your choice. For example, if you want to convert videos that are supported on web, then you can find the suitable output format, like it is visible in below screenshot. It is helpful if you want to upload videos on web. Once after selecting the output format, you can select destination location and can start conversion process. Apart from this, if you want to increase the conversion speed, then after selecting the output process, you can tap on Customize button to access Encoding speed option. Some similar software we reviewed earlier includes: TEncoder Video Converter, XMedia Recode, and XreCode II. It’s a handy software that you can use as video to video, video to audio, and audio to audio converter. 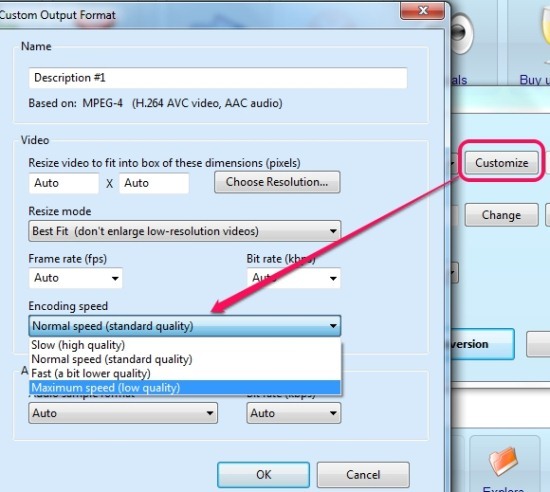 You can maximize the conversion speed if you can adjust with low quality output videos. You can also customize output video size (height & width), bit rate, audio sample format (mono or stereo) etc. Batch audio video conversion is possible with this video file converter. It is also helpful to convert only a specific part of a media file. Hence, it can be used as ringtone maker software. Anyone can use it completely free. SuperSimple Video Converter is good to use as you can select conversion speed which is rare to find with some other video converters. Moreover, you can create ringtones using this software and can also generate media files compatible with iPhone, web, or other mobile devices. Give a try to this video file converter and download it using the link available below. Get SuperSimple Video Converter free.